... and when - strange in itself - 'Erica' kept quiet for some years, I also lost interest in my running. The only subject where school managed to give me a totally wrong self-image, was in athletics. I always considered myself to be a hopeless case, and was totally dumbfounded when the army made me realize I was a natural born long distance runner. All through my University years this was to be an important part of my identity, and it wasn't until 1984 - the year after I stopped dressing as a woman - that I also stopped running, suddenly & without warning. I guess I should have been suspicious when, in 1989, I got my running shoes out again; less than a year later my seven calm years as a 'former trans' were over. Obviously this was really a matter of trying to run away from it all, but it did improve my self image considerably; Without even training much, I managed to run four sub 1:20 half marathons, four out of my eight marathons in between 2:45 & 2:50, and a 30 k cross-country in 2:01. In 1994 and '95 I ran the 72 km Swiss Alpine Marathon, and my last heroic feat was to complete 100 k - 62,5 miles - in just under 10 hrs. 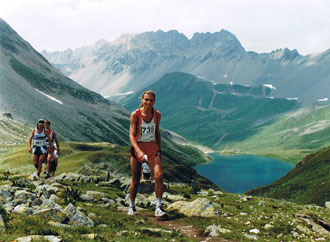 This was in 1996 and no more than 100 Swedes had ever run this far. That gym teacher Rune Larsson had by then won the 250 k Greek Spartathlon a number of times, and twice finished the 1000 k race between Sydney & Melbourne, is a different story - as is the fact that five years later he rowed from Europe to the West Indies, and that he ran across the US for his 2004 vacation; So it goes. Ten months after I ran my 100 km, I suddenly realized that "I'm really a transsexual" - and stopped running again. It was to be more than six years before I even ran to catch the bus. of books on Taoism & Zen Buddhism, and meditated on a daily basis. By the time 'Erica' surfaced again this had all but stopped, but I do have a number of quite satsifying watercolors to prove it - and vivid memories of an incredible afternoon of heightened awareness, as a result of my meditating; Never before or after has the world shimmered that beautifully! 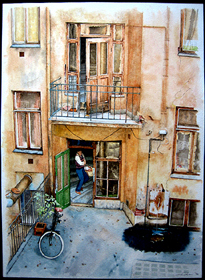 The one on the left shows the back yard of the house where we lived 1975-78. T's black bicycle was stolen not long after I took the original photo. 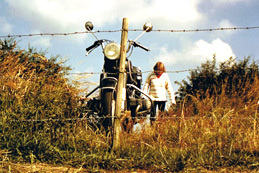 My other passion has always been motorcycles - but don't ask me why; When in 1974 I bought my BMW 600 cc none of my friends rode motorbikes, and I still have no idea why this felt like the most obvious thing to do. 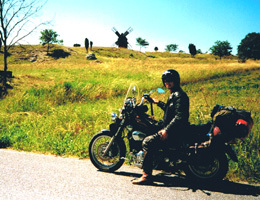 That summer we traveled 8000 kilometres - 5000 miles - through an extremely rainy Europe. 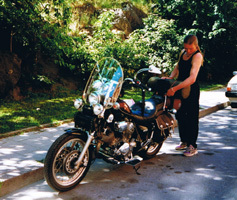 The following year we went to Sweden's far north for our wedding, but when also our journey home, through Norway, turned out to be a very wet affair, T convinced me to sell the bike. 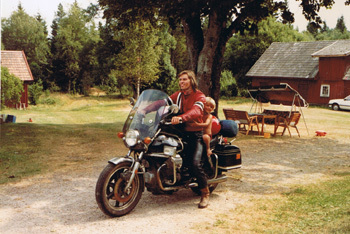 Right: With my son Markus on the Guzzi in Aug 1982. My mother's birth farm in the south of Sweden. 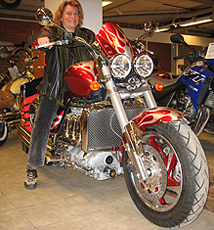 ... but in my own defence I must add that when five years later I sold this lovely bike, it was because I had few chances ever to use it; A trip to Denmark with a male friend on the passenger seat was a nice exception, though, as was a fall journey through Finland, with some new biker friends. 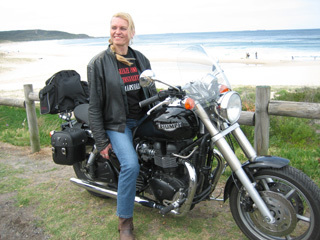 Another one was my one day out with a couple of lesbian bikers - a day that once and for all confirmed that worshipping motorcycles isn't 'male' behavior. Hadn't it been for society's late 70s conviction that there's no such thing as a homosexual post-op TS, this lovely day probably would have been enough to convince me that I was really a lesbian mtf transsexual. 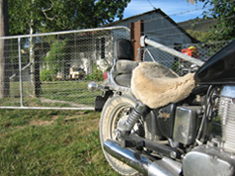 Masood's Yamaha Virago 750 cc. Left: Getting ready for our trip to .. Right: .. Gotland. 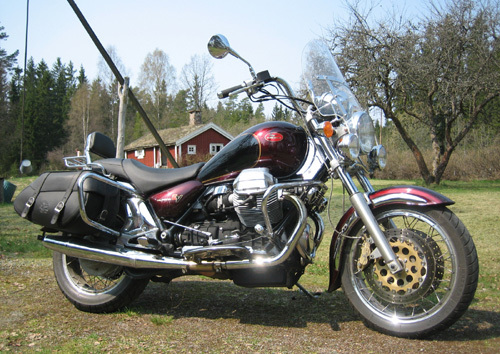 My bike situation didn't really change for the better until the mid 90s, when an Iranian colleague of mine decided that I simply had to borrow his Yamaha Virago a couple of times each summer. As not taking him up on this obviously would have been an insult of sorts, I was careful to oblige, with T's & my sunny 2001 week on Sweden's Baltic island of Gotland as the lovely apex. 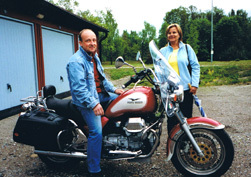 Another memorable day I owe to Masood, was when in August '00 I borrowed his Japanese love for an 8000 bike & 250 km yearly event called Mälaren Runt - this time riding with Helene, Cattis and quite a few more of my lesbian friends. Another nice interlude - a promise of future glories? 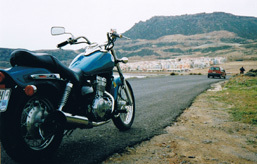 - was was our April '99 week on Crete, with a Kawasaki 500 Classic, as was my renting a 1300 cc Yamaha Royal Star for our youngest son's high school graduation two months later. 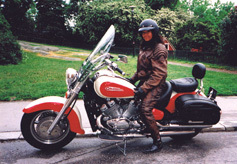 Pictured on the Yamaha is Claudia, Joel's girlfriend of the time. 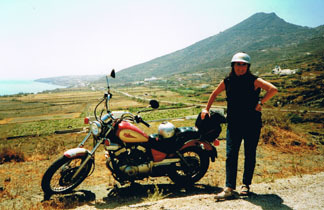 Less impressive was the 250 cc Virago we rented on the Greek island of Santorini, and this 2001 spring week was notable mainly because of my traveling as 'man' in spite of having been a legal female for two months; A last vacation for T with her husband. I suppose there could have been legal complications, though, as the man in the passport didn't officially exist anymore. When, approx 1500 BC, this volcanic island became a gigantic pressure boiler, it caused a tsunami many times worse than the one that hit Thailand and Sri Lanka in 2004, literally crushing the Minoan culture on Crete, some 150 km away; The explosion is believed to have been 3 million times the size of the Hiroshima bomb, causing waves 70 meters in height when they reached Crete's north coast. Next in line, is our '02 Tuscany vacation. 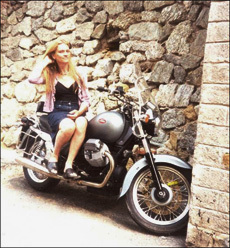 To my surprise, it was no easy task to rent a Moto Guzzi in Italy - no-one a prophet in their home town? - but I finally managed to localize Eligio & Mototouring in Milano, who helped me out with this brand new California Stone - bought from the Guzzi dealer the day before, just for us ;o) . Not only was this a lovely vacation, it also turned out to be a beautiful confirmation of most people's readiness to accept the image you try to project; Not even the big bike and our leather gear and helmets deterred the few remaining inhabitants in medieval villages from the impression that we were two ladies. ... and then spiced it with a ps re my new gender status. Regrettably the publishing of my exotic piece was delayed almost a year, but when, in January '04 & for the first time ever, I visited the Stockholm motorbike fair, the lovely people in the Guzzi Club booth - no, we never met before - immediately knew who I was, called me by name and asked if my brother had shown me the magazine? The welcome we got was no less than great, and next morning our brand new acquaintance Keijo totally made our day when he suggested that we borrow his bike for the day ride !?! 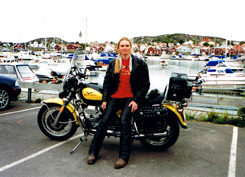 Right: On west coast island Tjörn with Keijos '94 Guzzi California in May '04. a fatal blow to our relationship. 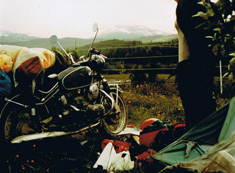 ... but paradoxically this turned out to be the 'right' decision, when a year later I was given the chance to spend three months at the company's Sydney office; Starting off with a 2-month vacation, and in effect being gone all summer & fall, there simply would have been no time left for a motorbike in Sweden that year. ... and my chance to build a social life as a gay woman where no-one knows me from 'before'. ... and was invited to join them for their traditional bush resort weekend, only five days later. 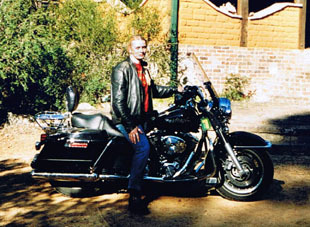 This being one of my Aussie dreams come true, I decided to go for the biggest bike I could find, and ended up with a Harley Road King for my three lovely days with thirty dykes, a handful of vombats, and about a million incredibly noisy parrots. In this case "biggest" really was BIG. It was a strange & powerful experience to drive this 330 kg babe along curvy mountain roads, but I was also surprised that it felt so much heavier than the 305 kg red & white Yamaha; Higher centre of gravity ? With only three weekends to go, I rented a 900 cc Triumph Speedmaster, which, in spite of its ridiculous name, was a lovely acquaintance. Saturday: North along the coast with my DOB friends. 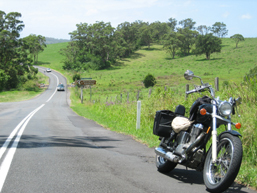 Sunday: Winding Blue Mtn roads to Wiseman's Ferry, with Girls Ride Out. This was where I met my friends to be, Sue & Duane, who invited me to their Snowy Mtns cabin the following weekend. 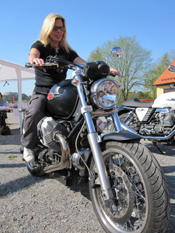 If you want to see more of these Italian beauties, I suggest a visit to the photo gallery of the Swedish Moto Guzzi club. For those into computers & confused by the website address, .nu is the denomination for a tiny island nation somewhere on the other side of the planet. Their domains are very popular with Swedish users for the simple reason that "nu" means "now" in our exotic langauge; "Guzzi now!" ... e.g. 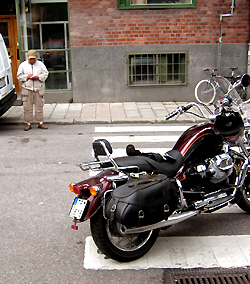 my first meeting with brand new Yamaha Midnight Star - one of the most beautiful bikes ever built? 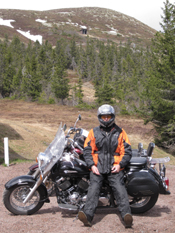 - and T's date with the world's - so far - biggest series production motorbike - the 2,3 litre Triumph Rocket III. "Biggest"? 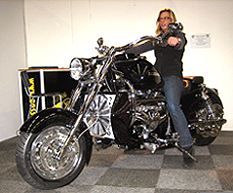 I guess it all comes down to if 350 bikes a year is manufacture or handicrafts; The Boss Hoss is a 500 kg monster with a 5,7 ltr & 355 hp V8. Still - after a few minutes on this giant at the 2007 Stockholm Bike Fair, I believe that it might well be a very nice acquaintance on the road. If this isn't enough they have a slightly bigger 8,2 ltr, 502 hp version, weighing in at another 90 kg - a grand total of lb 1300. 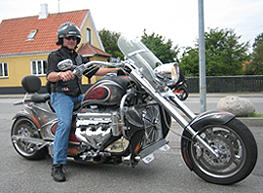 On the Swedish Boss Hoss site there's loads of photos from meetings & such not available on the US one. 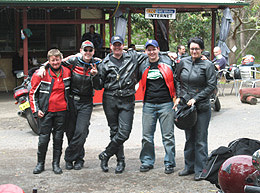 Next in line is lovely Panther Ladies Bike Club, catering for women over 50 driving cruisers. 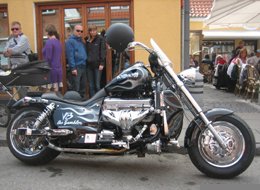 Photo from the 2006 MC-Dagarna in Västervik, on Sweden's south-east coast. 6000 bikers attended this four-day arrangement, another 3000 visitors came for the rock concerts, and 2000 bikes joined up for the Saturday parade through this little town. two steps to the left, is our president Lisbeth. ... and already for her second 'lesson' we drove half way around Stockholm and came back home on the motorway; Way to go, girl! 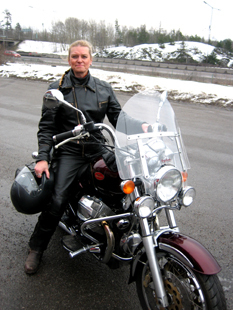 Regrettably Sweden's climate isn't exactly perfect for bikers, but when you're desperate for the liberating feeling of moving along on two wheels - what can you do? Then there's the guys who believe that the street is all theirs; This moron drove much too fast on a one way street - only it wasn't. 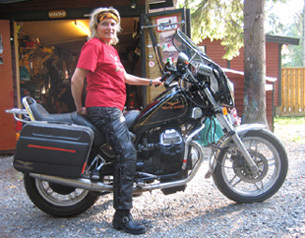 One of my Swedish biker dyke friends was a member of WIMA already in the late 70ies. Regrettably I wasn't woman enough at the time, but considering this and the fact that my late friend Rita showed me photos from the 2006 WIMA Rally in Switzerland, it's really quite strange that I didn't sign up as a member until early 2008. The workings of the mind ... ? Not yet having sorted my photos from the May meet in southern Sweden and the August one in eastern Finland, the least I can do is to contribute with a few WIMA links. The flags will take you to the national organizations & the Japanese site is lovely! 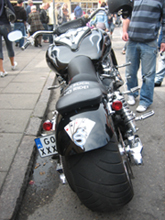 Top left: The 8,2 ltr, 502 hp model in Denmark July '08. 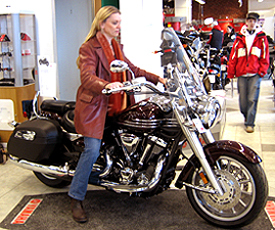 Top right: Katarina on the 5,7 ltr & 355 hp "standard" bike January '09. 355 hp though. A wealthy Polish guy or gal on vacation in Skagen, Denmark. ... and of course (sic!) Sue gave me free access to her bike for the duration of my stay. 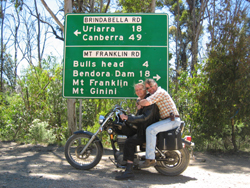 Leaving the coast for Canberra, 29 Dec.
gravel roads over the ridge. belong in her past - now it's all about cars. 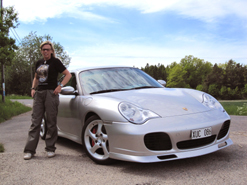 with his turbo charged 450 hp Porsche. 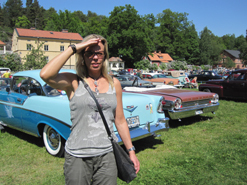 Katarina's dream car: Pontiac Firebird, with its spellbinding V8 engine.